Our first find is an endemic. We haven't seen anything like it in any other country. The drawing is peculiar because we have two heaps both at the same side of the worker. Normally the man is shoveling between the heaps. One find from Turkey comes close. 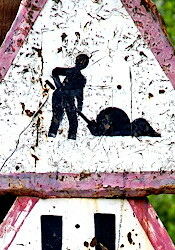 It is a sign were the man wields a pickaxe over a wavy structure that may be a row of heaps of earth or a patch of cobblestones. Notice the speed limit of 5 km. It may very well happen that pedestrians in a hurry have to slow down. This upper limit is shared with Vietnam and is even lower than the lowest limit — which is 20 km — we have for the Children's Crossing Signs (see table in Australia). 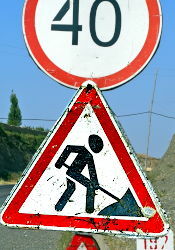 The second sign features the Workman from Russia. He can be found in most, if not all, of the countries in the former Sovjet Union. We have him reported from here and from the neighbours Kyrgystan and Uzbekistan in the east to Belarus and Lithuania in the far west.